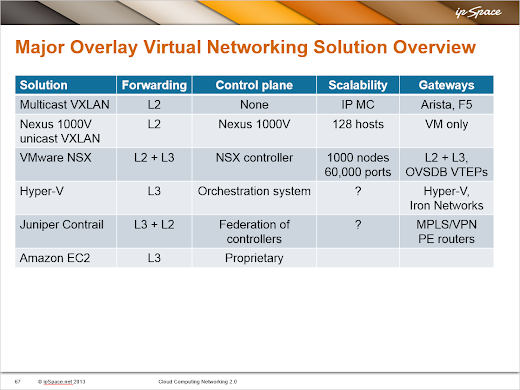 The table includes shipping products with publicly-available documentation (VMware NSX is an exception – they still don’t trust us to understand the documentation … but at least you can watch the NSX architecture webinar). One can always implement a gateway between an overlay network and physical world with a multi-NIC VM. Those solutions aren’t listed in the Gateways column. VMware NSX for multi-hypervisors has bare-metal L2 and L3 gateways, VMware NSX for vSphere has VM-based gateways with in-kernel L2 and L3 packet forwarding. Hardware gateways for VMware NSX for multiple hypervisors (using OVSDB protocol) have been announced, but we haven’t seen a GA product yet. Multiple vendors have announced hardware NVGRE gateways, no major vendor has shipped one. Scalability of Hyper-V depends on the orchestration system. I couldn’t find maximum number of managed hosts supported by SC VMM 2012 – earlier versions support up to 400 hosts. I couldn’t find the number of hosts or ports supported by a Contrail controller. Scale-out architecture using controller federation and BGP route reflectors is probably limited by the number of MP-BGP routes supported by the BGP route reflector (Contrail solution uses one VPNv4 host route per VM IP address). Nexus 1000V does provide L2 gateway for VXLAN to VLAN (in VM or Nexus 1110 form factor) or you can pair it up with CSR for L3 routing/gateway or physical switches.